A man stands in the middle of a boat on a steady lake. As he walks toward one end the boat will __________. The motion of the boat ( ) needs to counteract the motion of the man ( ). As the man's foot pushes him forward, the boat pushes back (Newton's third law). Due to opposing forces, the boat will move backward as the man moves forward. This scenario can also be solved by looking at momentum. Both the man and the boat start from rest, so in order for momentum to be conserved once the man gains positive velocity, the boat must gain negative velocity. A box of mass is hung from the ceiling by a rope. Find the tension in the rope. There are only two forces acting on the box: the force of gravity and the force of tension in the rope. Since the box is not in motion, we can assume that the system is in equilibrium and the net force is equal to zero. Rearranging, we can see that gravity and the force of tension will be equal and opposite. Calculate the force of gravity using Newton's second law. Note that the force of gravity is negative, since it acts in the downward direction. Use this value to solve for the force of tension. 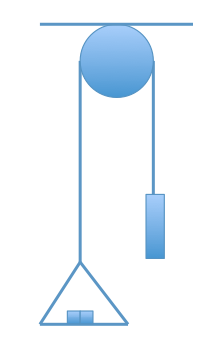 A 2kg mass is suspended on a rope that wraps around a frictionless pulley. The pulley is attached to the ceiling and has a mass of 0.01kg and a radius of 0.25m. The other end of the rope is attached to a massless suspended platform, upon which 0.5kg weights may be placed. While the system is initially at equilibrium, the rope is later cut above the weight, and the platform subsequently raised by pulling on the rope. Assuming the system is motionless, how many weights must be on the suspended platform? Given that the system is motionless and that the tensional force is constant throughout the rope, we know that the weights on the platform must balance the weight of the mass. Given that the mass weights 2kg and each weight is 0.5kg, we can determine the number of weights required by dividing 2kg/0.5kg = 4 weights. Note that we can neglect the weight of the pulley in this problem; while this is usually the case on the MCAT as well, be sure to double check. An object mass is on a table with a coefficient of kinetic friction of . 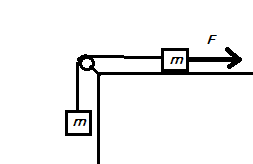 The object is tied to another object of the same mass by a string on an ideal, frictionless pulley. the object on the table is moving to the right due to the uniform force . What force needs to act on the block on the table in order to give the two blocks an acceleration of to the right? For acceleration to be zero, the force needs to equal the sum of the frictional force on the block and the gravitational force on the hanging block. To then accelerate the system, an additional force is needed. A force and a force act at the same point on a block of wood. The force is pushing east and the force is pushing north. What is the summed force vector? Since the two vectors are perpendicular, they form a right triangle with the vector sum. Therefore, we simply use the Pythagorean theorem to solve for the sum. The two vector components' directions determine the vector sum's direction as well. Since the components are north and east, the resultant vector is roughly northeast. A shuttle launched into space continues to fly in the direction it was sent even after its thrusters have turned off. What law does this illustrate? Newton's first law indicates that an object in motion will "want" to remain in motion at constant velocity unless it is acted on by a net force. In this case, Newton's first law is the only reasonable answer since in space, it is assumed there is no frictional or gravitational forces acting on the shuttle. Newton's second law can be described using the equation . Note that his first law is just a special case of the second law, where . Snell's law describes the interaction between waves and different media. Kirchhoff's laws involve charge conservation within circuits. Pascale's principle indicates that pressure exerted within a fluid is exerted equally in all directions. What force needs to act on the object on the table to cause it to accelerate to the right at a constant velocity of ? Since the block is moving to the right, we know that the frictional force is acting to the left. Also acting to the left is the gravitational force on the hanging block. Since it is a constant velocity of , we know that acceleration is zero and the downward force on the hanging block plus the frictional force is exactly equal to the force . Add the two forces.